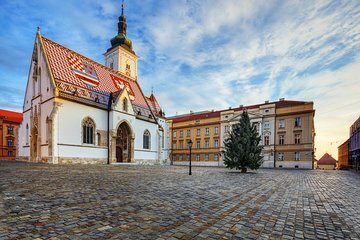 An increasingly popular place to visit, Zagreb is a lovely city with a plethora of great things for visitors to see and do. The Croatian capital has a number of beautiful Austro-Hungarian buildings scattered about here and there while it’s delightful medieval old town is a great place to wander around. Cafe culture is strong here too; grab a coffee and sit out on a terrace watching the world go by. 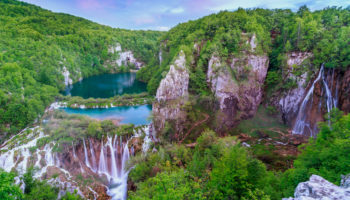 Whether it is art and culture that you are interested in or history and nature, Zagreb is sure to delight visitors with all that it has to offer. Located in Zagreb’s Upper Town, Lotrscak Tower dates all the way back to the 13th century and is one of the main landmarks in the city. Distinctive to behold, the tower was constructed to help protect the southern gate to the town and it offers up commanding views over the city. Looming over the funicular railway next to it, Lotrscak actually means ‘thieves bell.’ For the last hundred years, a cannon shot has rung out at midday to help mark the passing of the hour and allow churches around the city to synchronize their bells. When in Zagreb, it is almost inevitable that you will pass Lotrscak Tower while making your way around the city. Located under the medieval part of the city, Gric Tunnel was built during the Second World War to be an air-raid shelter. 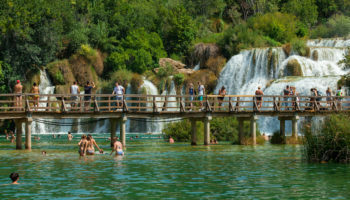 Since then, it hosted Croatia’s first raves in the 90’s and is now used to host cultural events, exhibitions, and fashion shows. Spanning three hundred and fifty meters, the tunnel also serves as a tourist attraction; you can now wander along it before popping up in a completely different part of the city. 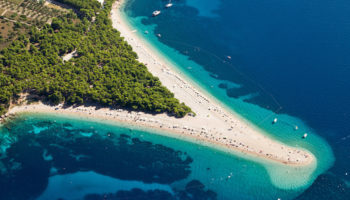 Due to its strategic location, over the millennia, a host of different civilizations and cultures have ruled or set up home in Croatia. Consequently, the ancient artifacts left behind are captivating to learn about. The Archaeological Museum is home to some delightful items that really do span the centuries; you can be ogling at a 2500 BC ritual vessel one minute and staring at shields and swords the next. With over 450,000 items housed in the museum, it is a fascinating collection to explore, with some lovely Greek, Roman and Egyptian artifacts. Located in the western part of Zagreb, this huge artificial lake is the perfect place to hang out and relax and is very popular with tourists and locals alike. With loads of activities on offer, you can be kayaking and swimming in the lake one minute and cycling and running around it the next. Its pebbled beaches are the perfect place to catch some sun. 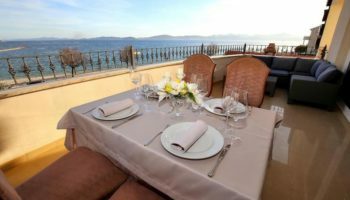 While Jarun Lake has lots of outdoor activities for you to enjoy, it also has some fantastic nightlife; there are a number of great bars and clubs for you to check out along the lakeside. In summer, the lake hosts the INmusic festival, which is great fun and yet another reason to visit Zagreb during the summer months. 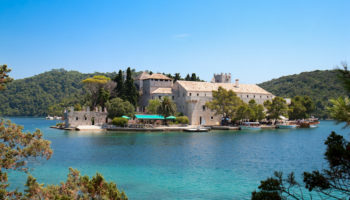 Dedicated to works of art by naive artists, the Croatian Museum of Naive Art houses nearly two thousand paintings, sculptures, and drawings, although only around a hundred of them are on display at any one time. As such, it doesn’t take that long to go around, although it is well worth the effort, as there are some fantastic works on show by Ivan Generalic and Mirko Virius, amongst others. 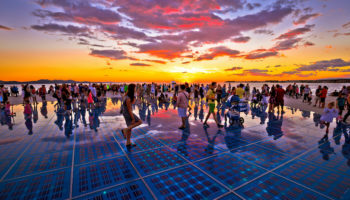 While the majority of the works exhibited are by Croatian artists, there are a number of pieces by international artists that are showcased – all of them are from the 20th century. With such a unique collection, it is an interesting place to stop by. This was actually the first museum in the world specifically dedicated to naive art. Located in the heart of the city, Jelacic Square is a bustling place, full of life and energy. As such, it is definitely worth passing by when you’re in Zagreb. With the downtown part of the city all around it, shops, businesses and offices line Jelacic Square. The constant flow of people passing through the area makes it a great place for people watching. Named after Count Josip Jelacic, his statue stands proudly in the center of the square amidst all the lovely facades that display such a diverse range of architectural styles. 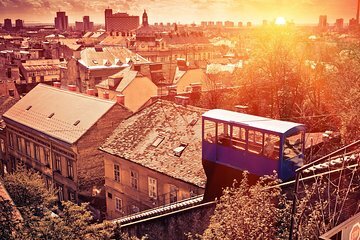 Running every ten minutes, the funicular railway in Zagreb connects Ilica Street to Strossmayer Promenade and the Lower Town to the Upper Town. While it only rises 66 meters up the side of Gric hill and is the shortest funicular ride in the world, you find yourself in a completely different part of the city as you enter the medieval part of Zagreb. Despite the short journey, it is a very steep trip up the side of the hill and many locals have relied on it during the 120 years that it has been running. Bustling with life, Dolac Market is where locals come to buy their fruit and veg as well as any hams, cheeses and artisanal products that they fancy. Great fun to peruse, this daily farmer’s market is only open in the mornings; consequently, you’ll have to wake up early to really experience the local side of the city. Mostly featuring fresh produce from farms surrounding the city, it is often called the ‘Belly of Zagreb’ by locals, as so many of them rely on the market for their food. A delightful spot to visit, Dolac Market offers up an authentic side of Zagreb that many visitors don’t get to see. The largest park in Zagreb, Maksimir is also its oldest; it was first opened to the public all the way back in 1794. With five artificial lakes, as well as lovely little creeks and meadows, the park is delightful to visit; nature lovers, in particular, will enjoy being in its majestic natural surroundings and there is also a forest for you to explore. As well as the wild animals and birds that reside in its meadows, forests, and lakes, the city’s zoo is also located in the park and is a great day out for all the family. A very popular place amongst Zagreb residents; Maksimir Park is definitely worth stopping by when visiting the city. If you hadn’t already guessed by the name, the Museum of Broken Relationships is devoted to break-ups and is a fun and quirky place to visit. Located in Zagreb’s Upper Town, the museum’s collection seems like a hodgepodge of random items. In a way, it is, as they have all been donated by lovelorn people following a painful break-up. With display panels explaining the importance of the item and how it symbolized or defined the failed relationship, the exhibits range from the tragic and sad to the humorous and poignant. A slightly bizarre place, the Museum of Broken Relationships is definitely unlike anything you’ve ever seen before! Commonly referred to as Zrinjevac, the Nikola Subic Zrinski Square is located in the center of Zagreb and is a wonderful place to wander around. 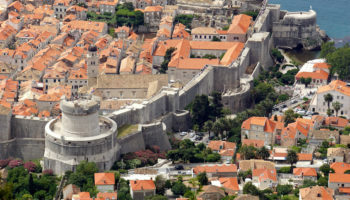 It attracts both tourists and locals with its beautiful monuments, tree-lined walkways, and impressive buildings. Acting as both a park and a square, the sculpted landscape is perfect if you want to kick back and relax in nature; there are some lovely fountains and busts of famous people for you to inspect. Numerous important buildings line Zrinjevac; among them are the city’s fantastic archaeological museum and the country’s Supreme Court. Indeed, art meets architecture, history, and nature in this leafy, peaceful park. As the most important cemetery in the country, it is here that many of Croatia’s most famous former citizens are buried. With politicians and artists, musicians and writers lying side by side with people of all religious denominations, there are lots of impressive gravestones, monuments, and statues scattered about the place. It is a beautiful cemetery to amble around peacefully. 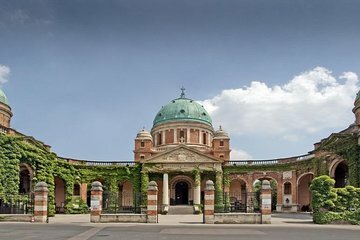 The architect Hermann Bolle designed the main entrance to Mirogoj Cemetery; its impressive architecture that encompasses a dome, arches and arcades certainly lets you know that you are visiting a grand and dignified place. Bustling with life, Tkalciceva Street is the place where both locals and tourists go to have a good time – it is a must-see when in Zagreb. 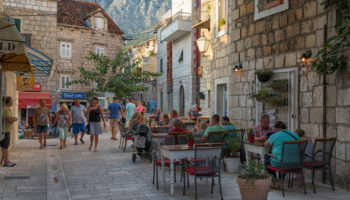 Named after a Croatian historian, it is a long winding street lined with charming little houses and balconies, which makes it the perfect place for a romantic stroll. With bars, cafes, restaurants, and clubs lining the streets, there is lots to see and do. You can enjoy some of the best local cuisines here before heading on to one of the nearby bars. Numerous venues offer live music and, with the best nightlife in Zagreb, Tkalciceva Street has something for everyone to enjoy. Consecrated in 1217, it is fair to say that Zagreb Cathedral has undergone numerous changes and setbacks over its long and tumultuous history. Razed by the Mongols shortly after being completed, and severely damaged in an earthquake, the cathedral that stands before us today is a stunning building and the architecture is simply awe-inspiring. Neo-Gothic in style, the facade of the cathedral glistens in the sun and its twin spires dominate Zagreb’s skyline. Used as an observation tower when the country was invaded by the Ottomans, fortified walls still surround the cathedral at certain points. Undoubtedly one of the most beautiful buildings in the city, the interior of the cathedral is just as magnificent, with statues and paintings adorning its walls. With the sarcophagus of the Blessed Aloysius Stepinac lying near the main altar, it is a very holy site and is dedicated to the Assumption of Mary. Situated near the main square, you’ll definitely come across the cathedral at some point on your trip to Zagreb. Dominating the square that bears the same name as it, St. Mark’s Church lies at the heart of Upper Town and is one of the most popular attractions in Zagreb. Despite numerous important governmental buildings lining St. Mark’s Square, it is the church that attracts everyone’s attention, thanks to the distinctive roof that makes it so beautiful to behold. Proudly displaying Zagreb and Croatia’s coats of arms, the checkered tiles delightfully stand out against the sparkling white building below it and the blue skies above it. Dating all the way back to the 13th century, the church is a charming place to visit and the architecture draws from Romanesque and Gothic influences. Indeed, the southern portal of the church is Gothic in design and has some splendid little effigies above it, which display some fantastic craftsmanship. In addition to its exquisite exterior – which is the undoubted highlight of the church – the interior is also lovely to gaze upon as there are some brilliant frescoes coating the walls. Well worth stopping by, no visit to Zagreb is complete without a visit to St. Mark’s Church.